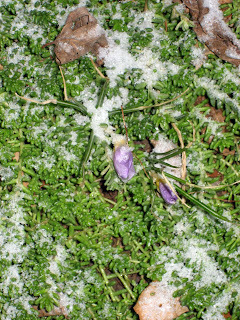 We had some snow showers this morning and my two little crocuses are still bravely hanging in there. They are still the only "blooms" outside, if you will allow me to call those blooms instead of buds. I feel like I should name them at this point, and I'll miss them when they actually do open up and fade away, if they do open up at this point. Has anyone had a flower around so long that they thought they should name it, with a name other than its botanical name? Since this did not turn out to be a day one could work outdoors, about the only gardening that I got done was to dispose of all the hyacinths, except one. Here are the hyacinths ready to be taken to the compost bin. I don't try to save the hyacinths and plant them outdoors. They would not transition well from water to soil, so I treat them like annuals. Plus the ground outside is frozen, so I'd have to pot them up indoors, and for a bag of bulbs that cost me less than five dollars, it doesn't seem worth the time. This trug has held up well, even though I've had it for 10 plus years and use it nearly year around. It would be a great gift for anyone who gardens and someday I might want a new one, but right now, this one is in fine shape and seems almost indestructible. 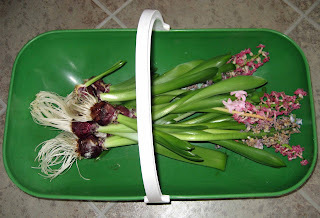 The trug's favorite job, by the way, is carrying vegetables in from the garden, not taking hyacinths out to the compost bin! I wish I could have started on some of my favorite spring-time jobs in the garden today. 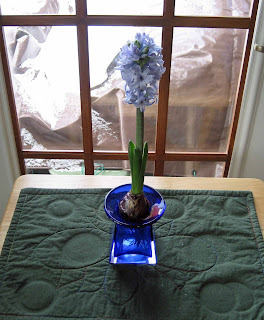 But on a cold, blustery March Saturday, I'm left with just this one hyacinth to tend to. Why did it bloom so late? It probably has to do with me not putting quite enough water in this particular vase, so it got a later start than the other bulbs. I think next year, rather than have all the hyacinth bulbs bloom more or less at the same time, I'll stagger starting them so I can enjoy them for longer as they bloom in succession. Remind me of that next year, when I pull new bulbs out of the refrigerator right after Christmas, okay? I'm not a gardener but yesterday I received a catalog from Spring Hill nurseries. They had a some gorgeous Josee Lilac bushes that are supposed to bloom all summer till frost (intermittently). I love lilacs. I guess if you order out of any catalog you are fair game for all other catalogues. That single blue hyacinth with the blue glass looks an absolute treat! What do you think? Should we get Grandma a Josee Lilac bush for Mother's day? Thanks for the link to the trugs. I have been wanting one for a long time but never found one. I think I will ask for one for Mother's Day. Do you think Ed could make the wooden one?